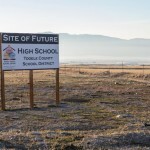 The Tooele County School District will build and new school to replace the old Vernon school. In December 2017 Vernon residents turned out in mass numbers to defend their school from possible closure. 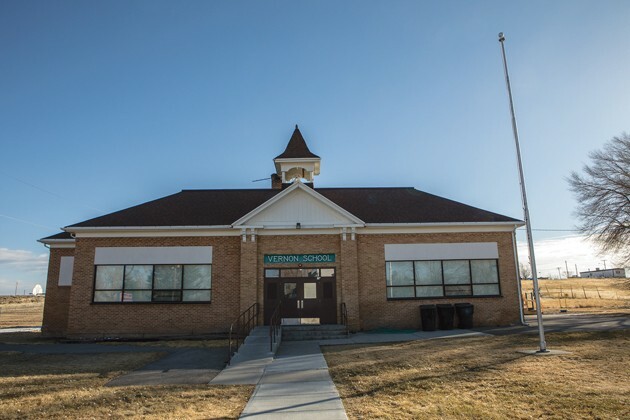 Monday night, in a meeting held in the community’s 113-year-old school building, the same residents praised the Tooele County School Board’s decision to build a new school in Vernon. School district officials and representatives from the architectural firm that is designing a new Vernon School, held a meeting Monday night at the old Vernon School to collect community input on the new school’s design. The school board voted in November 2018 to spend up to $2.5 million of the school district’s capital funds to build a new school in Vernon instead of closing the school and busing Vernon students over an hour to Dugway. Tooele County School Board President Maresa Manzione, Board Member Julia Holt, Superintendent Scott Rogers, Director of Operations Steve West, Construction Service Director Michael Garcia, and Principal Jeff Wyatt were among the school district officials that attended the meeting in Vernon. The current Vernon school building was built in 1905 and remodeled in 1929, the same year that the school district lifted its ban on hiring married women as teachers. The building is coal-fire heated and a rope dangling through a hole in the entryway ceiling is attached to a bell on top of the building that is still rung to signal the end of recess. Facility wise, the building needs a seismic upgrade including reinforcing the bell tower, the restrooms and playground equipment need to brought up to American with Disability Act requirements, the school’s lighting needs to be upgraded, the coal furnace needs to be replaced, exterior masonry needs repair, the attic needs insulation, and the irrigation system needs to be upgraded, according to the school district’s facilities report. Academically, the enrollment at Vernon School was 22 students in 2018. The students were organized into two classrooms. The kindergarten through second grade class had 13 students and third through sixth-grade had nine students. Tintic School District has an elementary school in Eureka near the Juab and Tooele county line that is 25 miles southeast of Vernon. Eureka Elementary School has 92 students in a building built in 1995. The drive to Eureka from Vernon is 26 minutes compared to an hour and six minutes for the drive from Vernon to Dugway using state Routes 36 and 199, according to Google Maps. With 14 elementary students and 24 secondary students from Vernon choosing to attend school in Eureka, the Tintic School District sends a bus to Vernon. A change to a four-day school week and a new building may entice some parents to keep their students in Vernon, according to a survey completed by the school district. After hearing support for their school from Vernon residents, the Tooele County School Board promised Vernon residents that it would continue to look for alternatives to keep the town’s two-room schoolhouse open. 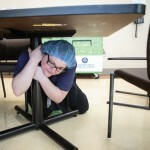 “To all of our patrons in Vernon, I say, ‘Hold on. We will take care of you. We are working on it,’” said school board member Kathy Taylor. West and Philip Wentworth, with Salt Lake City-based Naylor Wentworth Lund Architects, reviewed the preliminary floor plans for the building with Vernon residents during Monday night’s meeting. The new building will be about 30 percent bigger than the old building, with 8,300-square feet in the new building compared to around 6,000-square feet for the old building. The new building will have three classrooms with the latest technology and new furnishings, state-of-the art security features, a 1,348-square-foot multi-purpose room with an eight-foot high basketball hoop and a retractable stage area, a media/testing area, a kitchen, and a teacher collaboration/workroom/office. Olson said he wants the exterior of the building to reflect the character of Vernon. Rogers suggested the old bell could be put in a memorial structure similar to the bell at Tooele High School. 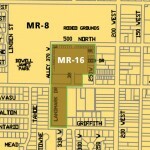 West estimated that the design phase for the building will take another four or five months. The school district has plans for another community input meeting in Ibapah, as both Vernon and Ibapah buildings will use the same floor plan with different exteriors. After the design phase is completed it takes around another month for permits and approvals. A new school building requires approvals from the State Office of Education, the State Fire Marshall, the county Health Department, and other state and local agencies. After design and approval, construction takes nine to 12 months, according to West. “It’s very possible that Vernon students will be in this new building by the year after this fall,” West said.